What started as a simple day of three planned stops and 5 hours of planned driving turned into a 13 hour day with over 12 stops. While it was a long day on a few hours sleep, every moment was exciting and the sun stayed up till after 9p to ensure I could see everything I hoped. 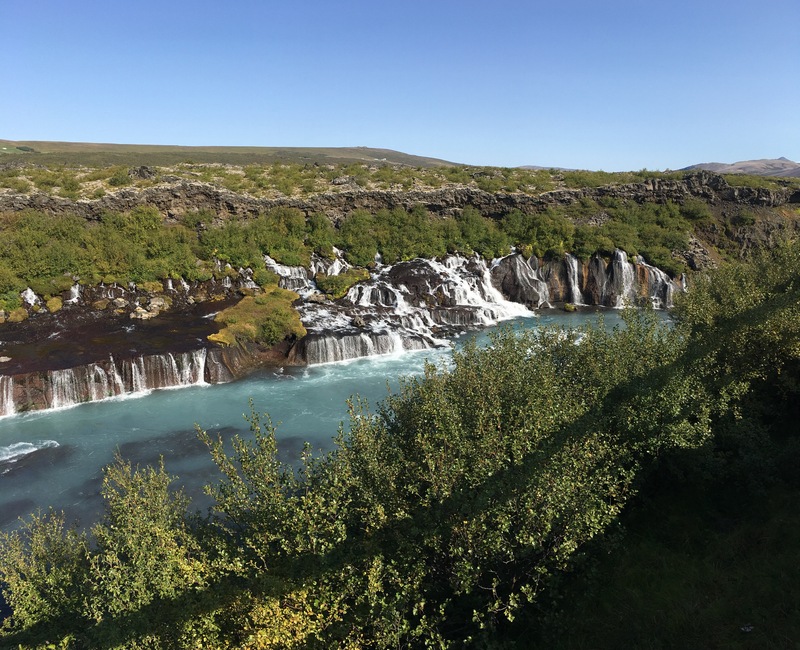 Today’s itinerary was to drive from Keflavik Airport to the Snæfellsnes Peninsula in Western Iceland with a detour to see Hraunfossar (lava falls) and Barnofoss waterfalls. 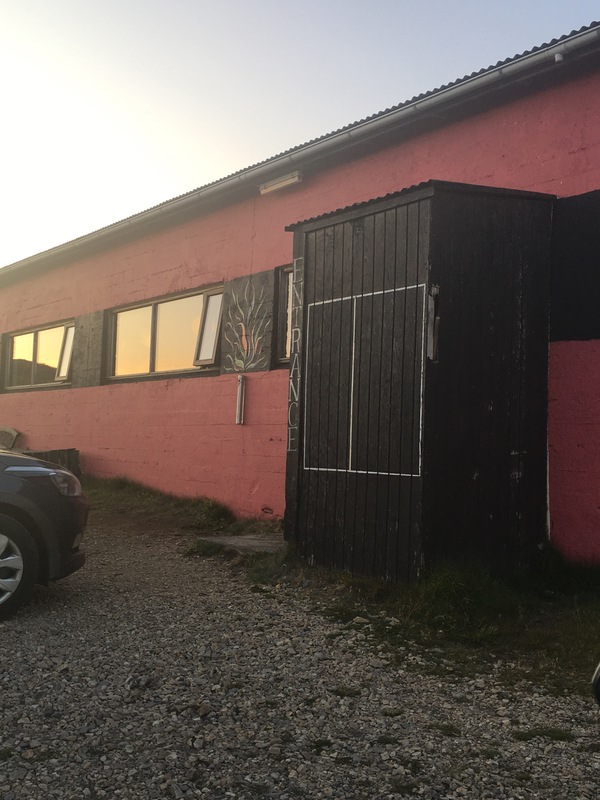 My accommodations were booked at the Freezer Hostel in Rif on the north side of the peninsula. I was going to drive up from Reykj along the south side of the peninsula then work my way to the west coast and up and around. 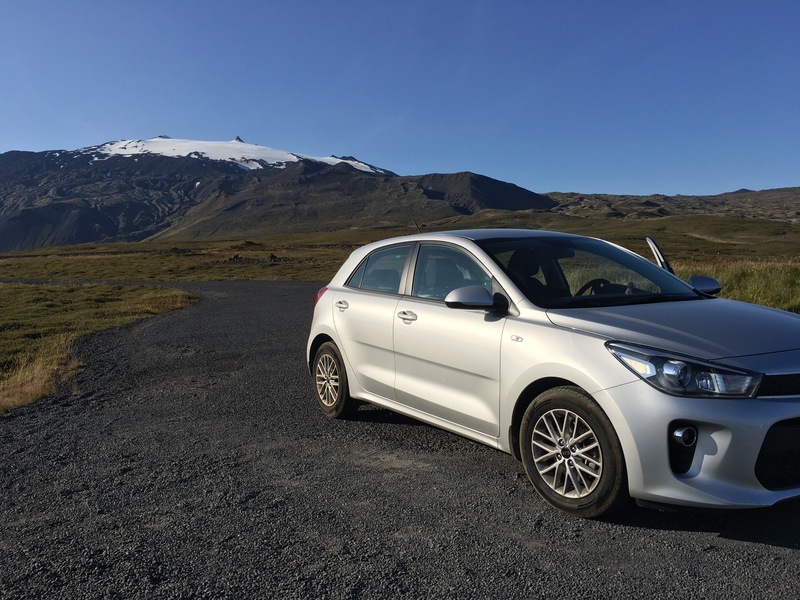 While my SIM card was working, I was having trouble getting the turn by turn navigation on Google maps to work, so I learned the highway signs and managed to get myself to the lookout point in Reykjavik where I had started my first trip to Iceland last year. It seemed poetic, if even by accident. I took some scenic shots and then was off for the west. There was morning rush hour traffic motivating me to head for the fjords asap. 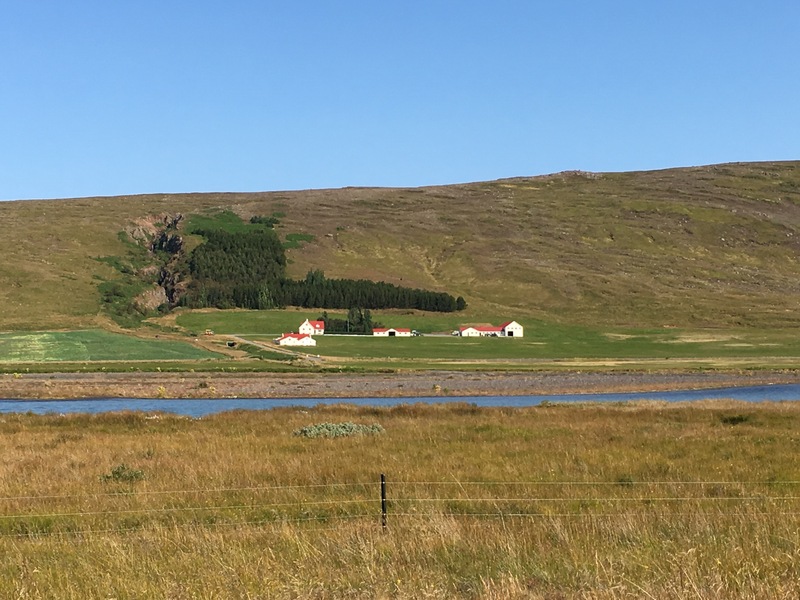 I was mesmerized by every turn in the road and color in the country’s landscapes as I passed the highlands outside Reykjavík. 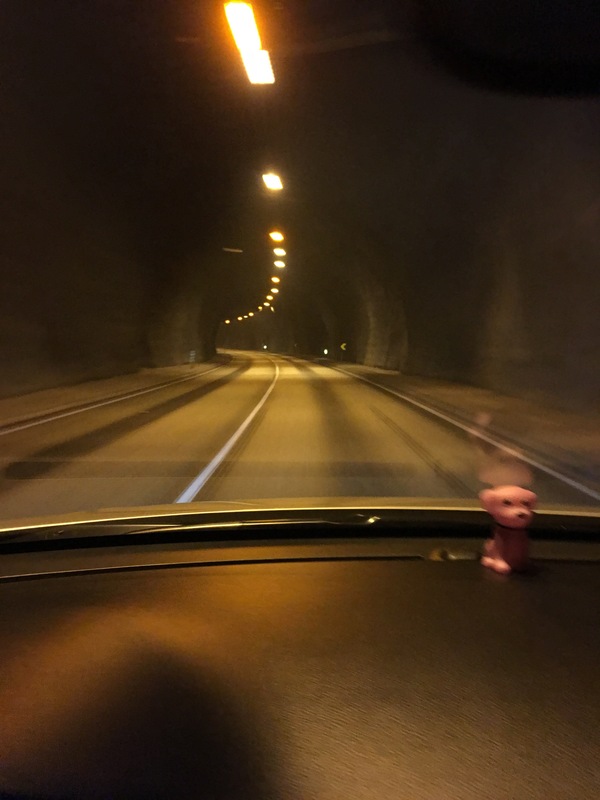 My route took me through the long Hvalfjörður tunnel that went below the fjord. The tunnel turned from creepy to cool, to this is the longest tunnel ever! There were signs letting me know how far inside the tunnel I was. I’m 4km in, 2km to go. 5km, 1 km to go. The ride like a fun carnival ride I was disappointed had to end. Once past the tunnel, there was a sign with a map and images of the top sights in the region. This regional “advertisement” motivated me to add additional stops to the itinerary like Anastarpi. 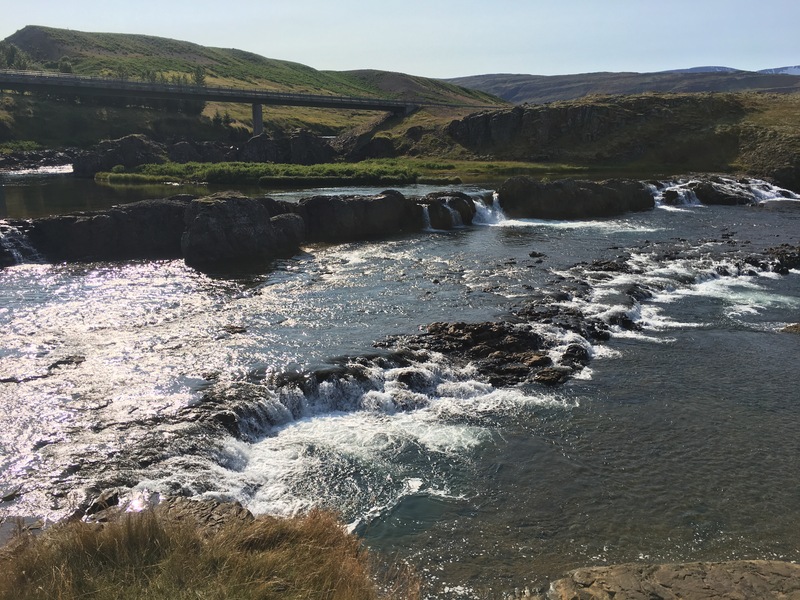 The Iceland I knew started to change into more wonderful landscapes. 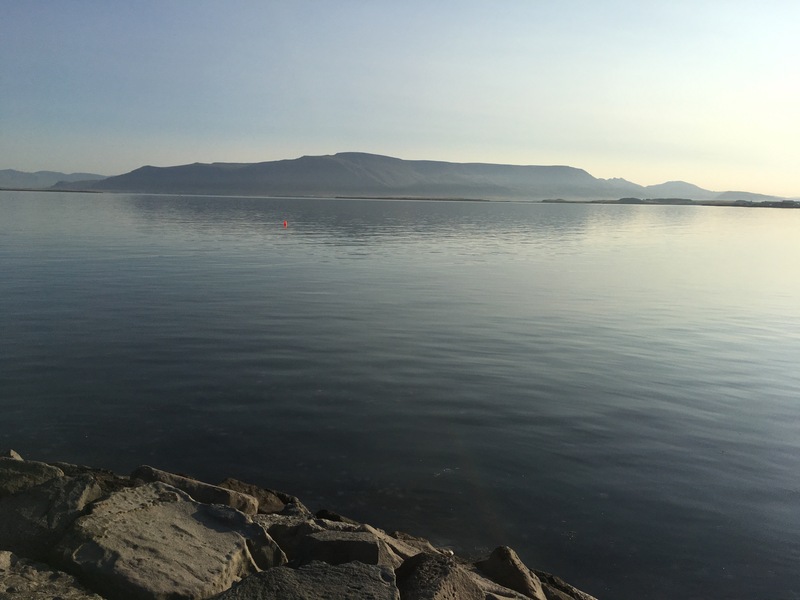 I was so lost in the moment of the Hvalfjörður and Borgarfjörður. Looking back, I know realize how industrial feeling some parts were, though the beauty was too captivating to really notice. I was trying not to stop every time a postcard worthy landscape that appeared, but I couldn’t help it at times. Google started to give navigation, but would lose me when it’d go offline. I ended up gravel road I didn’t need to be on, but that’s ok. I got some awesome pics! It was this inner need to stop for pictures that led me to a gorgeous waterfall by accident. I was about to cross a bridge and noticed a jeep on the side of the road with flowing water next to the vehicle. After I safely crossed the bridge, I pulled over, put on my hiking shoes and found a stunning set of small falls called Fossatún. Fossatún is said to have the face of two trolls in its rocky walls. My first waterfall of the trip was on the books! 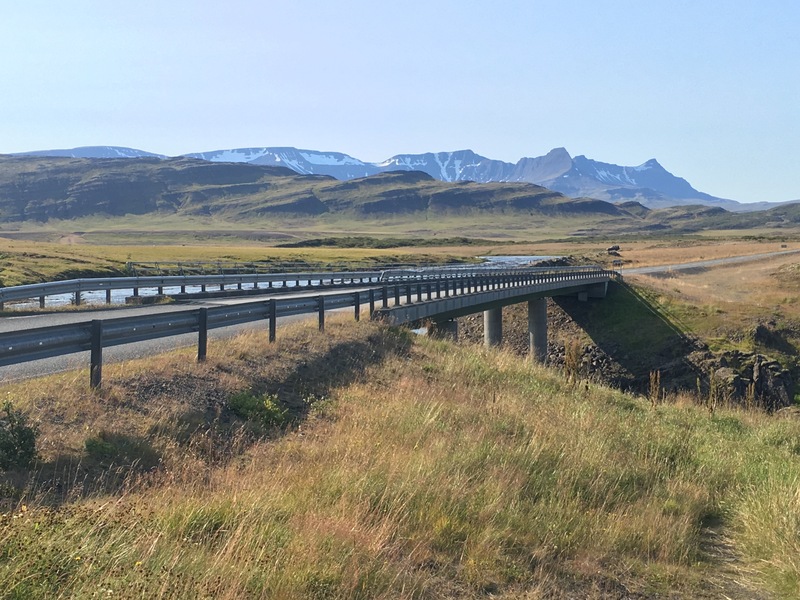 I was eager for more and increased my speed to the actual speed limit as I set off for Hraunfoss and Barnafoss. 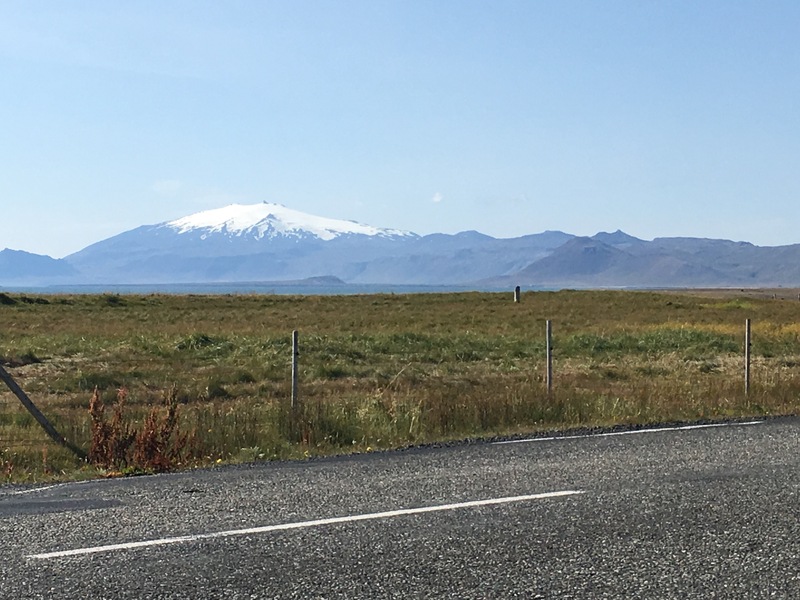 I made a pit stop in Borgarnes for provisions and a photo op of the Borgarfjörður along the way, and enjoyed the sights of Reykholt from the car. As I crossed the fjord bridge, I started to feel like I was in a car commercial. 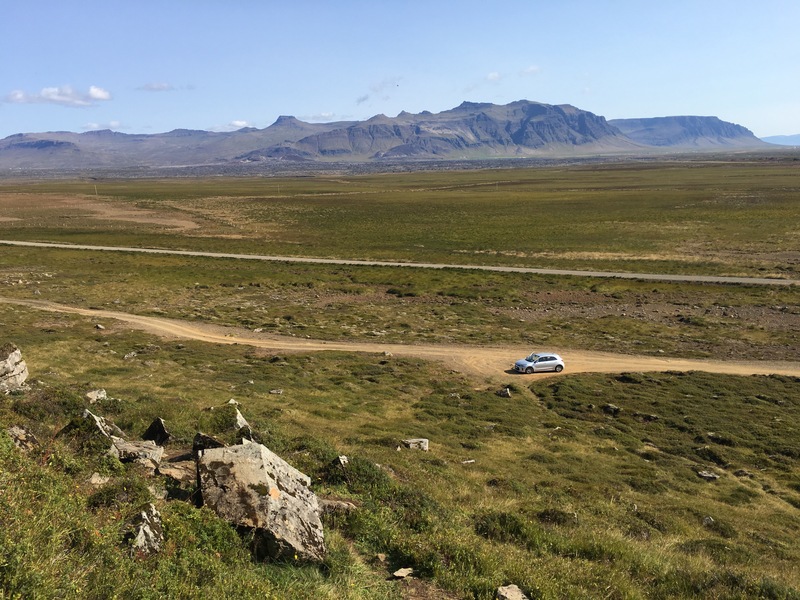 You know, the ending where the car is driving across some stunningly beautiful landscape we can only dream of visiting someday and the driver has a huge smile of enjoyment on their face. Yep. In my mind, I was that driver. Hraunfoss reminded me of a tropical island. I was taken away to yet another far off place in my mind. It may have also been the rising temperatures. Time to take off that fleece. It was at this point I started to miss my family and Alan. Alan likes to take photos of rushing water and waves, so I grabbed a shot for him. I also sat down to write my grandpa a postcard. 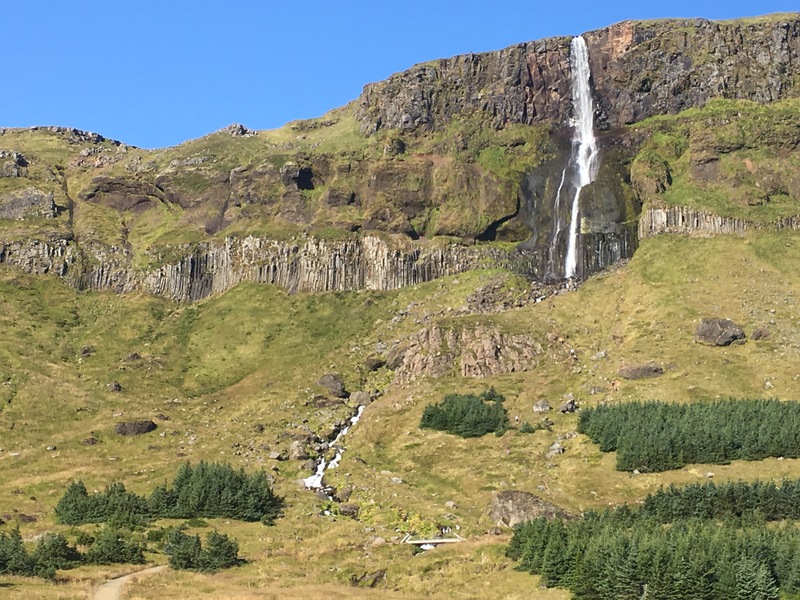 It was barely noon, and I had seen three waterfalls. I was feeling accomplished. 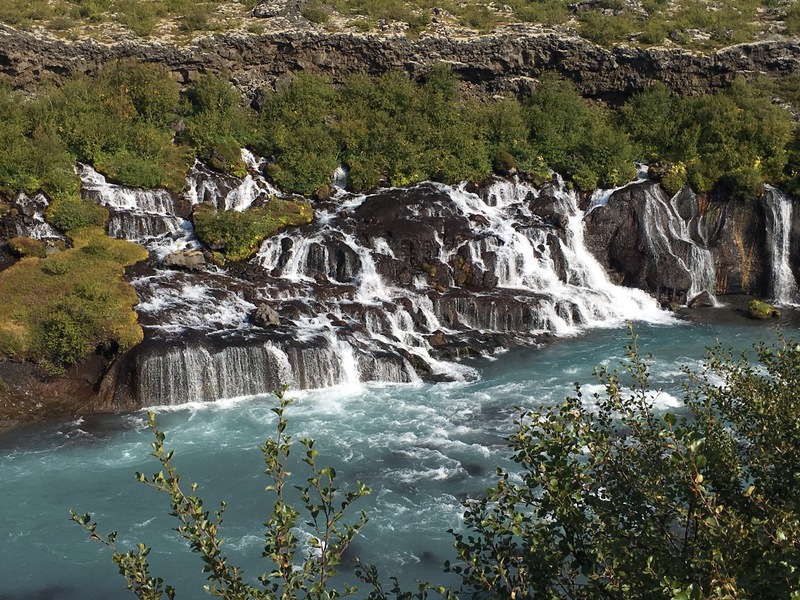 On my way from the pair of fast flowing falls, I found three hitchhikers headed towards my next stop, Borgnares. I know. I can hear my mother shouting at me- never pick up hitchhikers! There’s a reason it’s illegal in the US and why it’s how every horror movie starts. I haven’t gone crazy. Don’t worry. Iceland is different. That’s what I love about it. My biggest concern was the last time any of us had showered. See, they don’t look too dangerous. When we made it to their stop, Google took me on the outskirts of town instead of the city center. 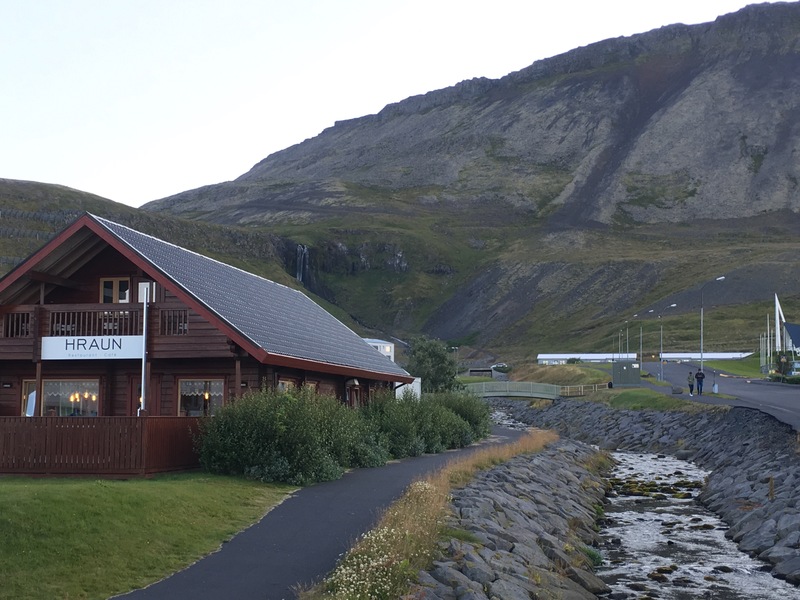 I had planned to stop at the museums to learn more about Icelandic sagas, but completely forgot. I was too distracted by the landscapes. I had learned of the sagas while in Reykj, but wanted a refresher while in the region they occurred. 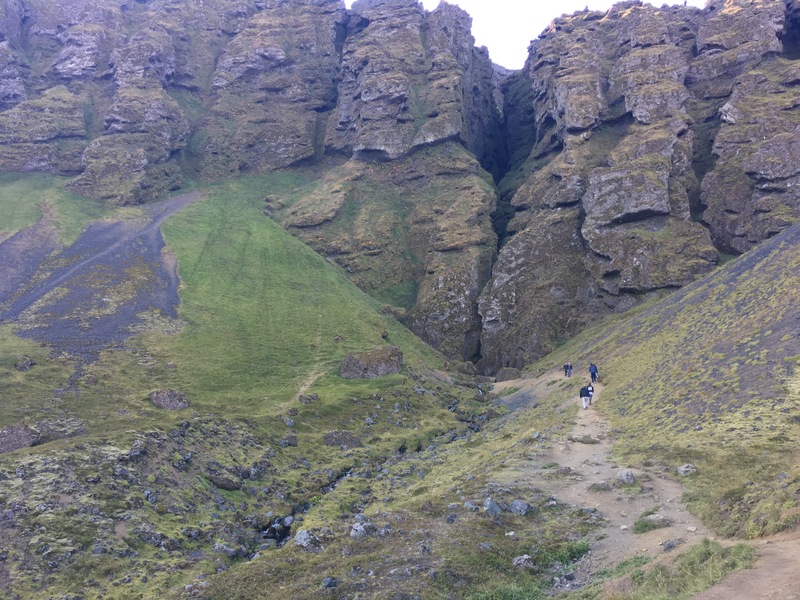 I offered to take the group to the city center or invite them to join me on my next stop, Gerðuberg Cliffs. They didn’t know what the cliffs were so we googled it for a image. Once they saw the pic, they decided to join. 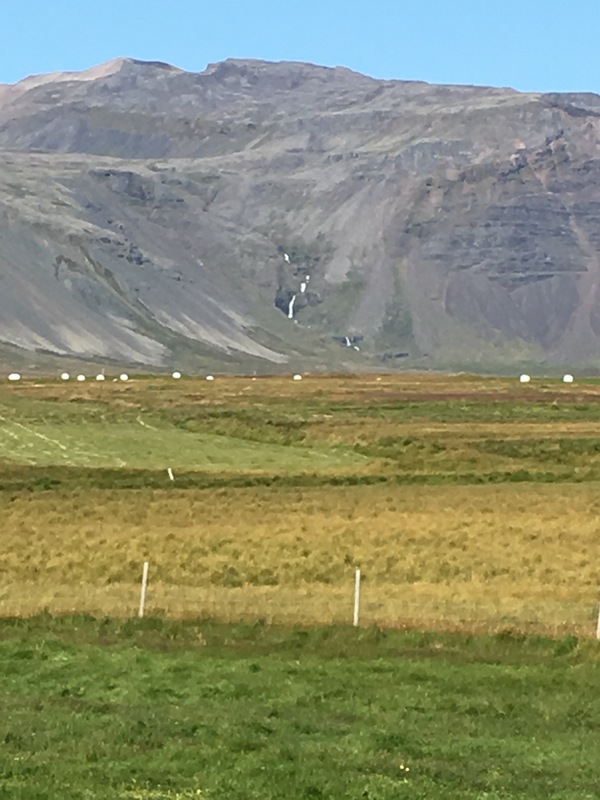 The cliffs could be seen from the ring road, but not close up. Not the picture worthy levels of close we were going for. So we found a gravel road that led to them. The gravel was beating up my little economy 2wd so I took an off road route that was smoother, even though I’m not supposed to go off road. 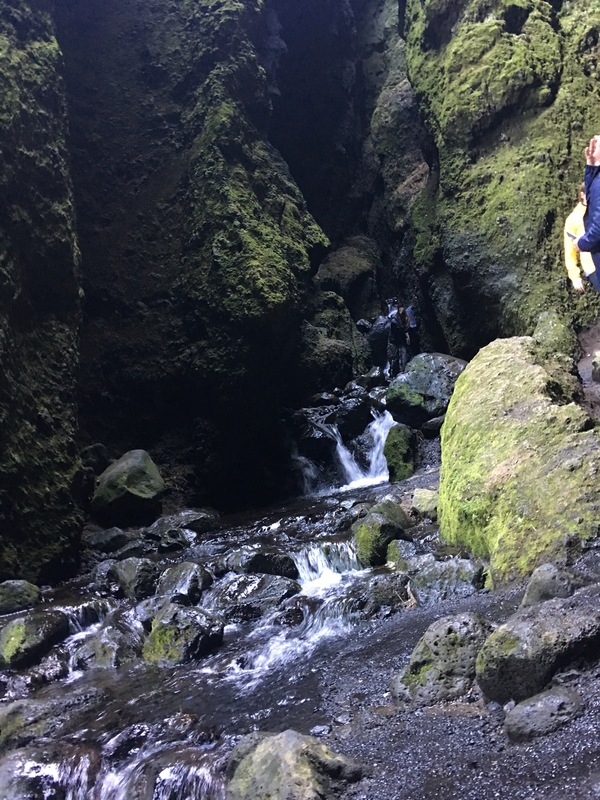 We pulled up to the basalt columns, took our pics, and then one of the group decides to climb up even closer. One by one we each made our way up to the basalt wall. We could see the Eldborg Crater and the entire valley. It was another car commercial worthy moment, so I caught this one on film. We breathed it in, returned to the car, and headed for more of the peninsula. 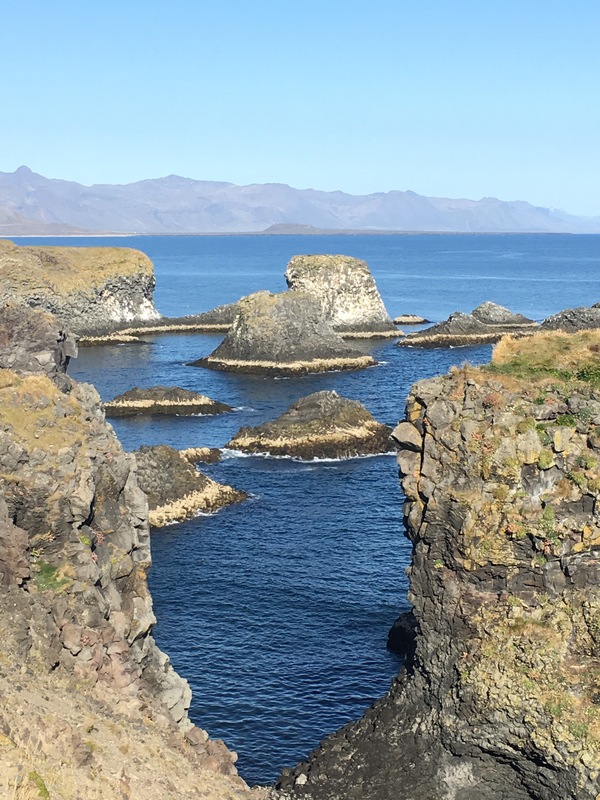 The Snæfellsnes Peninsula is said to be a miniature of what Iceland has to offer with waterfalls, breathtaking scenery, and a glacier covered volcano all on a bed of lava. 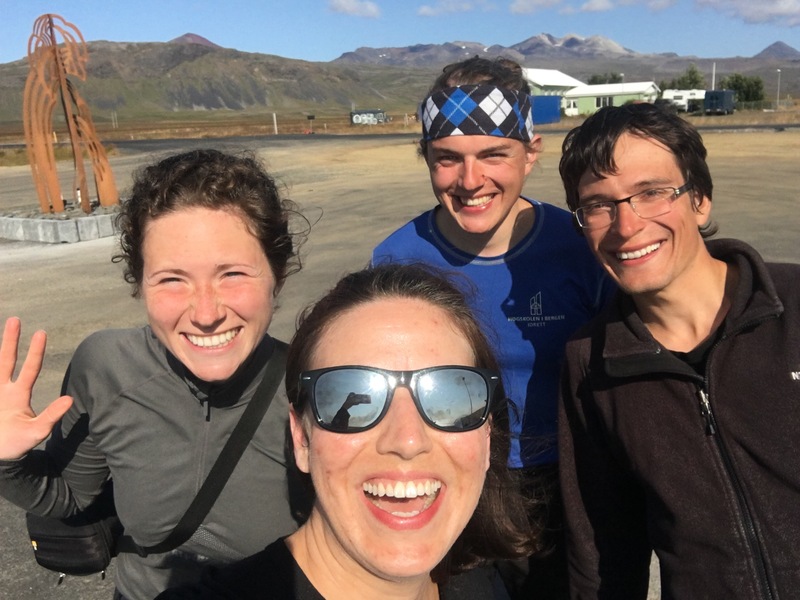 The hikers got out and headed to the north as I continued straight west to the volcano via the southern route. 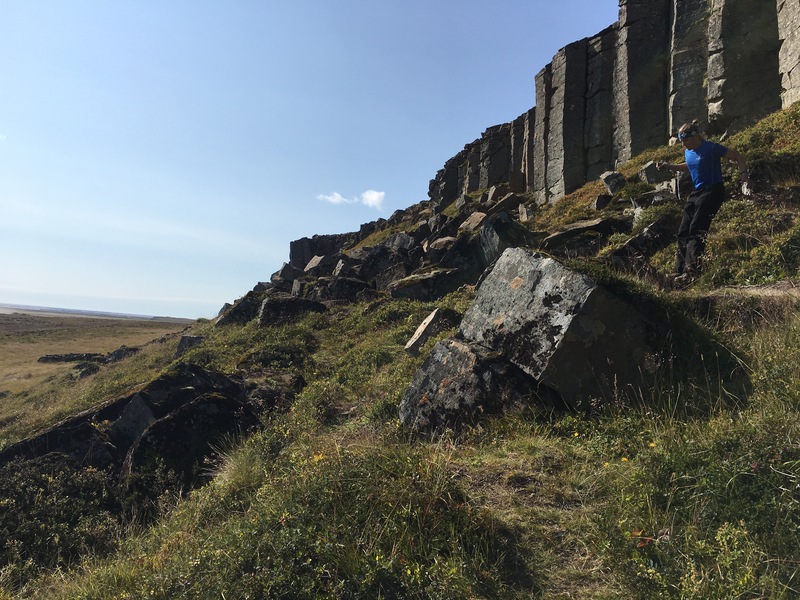 The ash covered cliffs made a dramatic landscape against the low flatlands that dropped into the ocean. 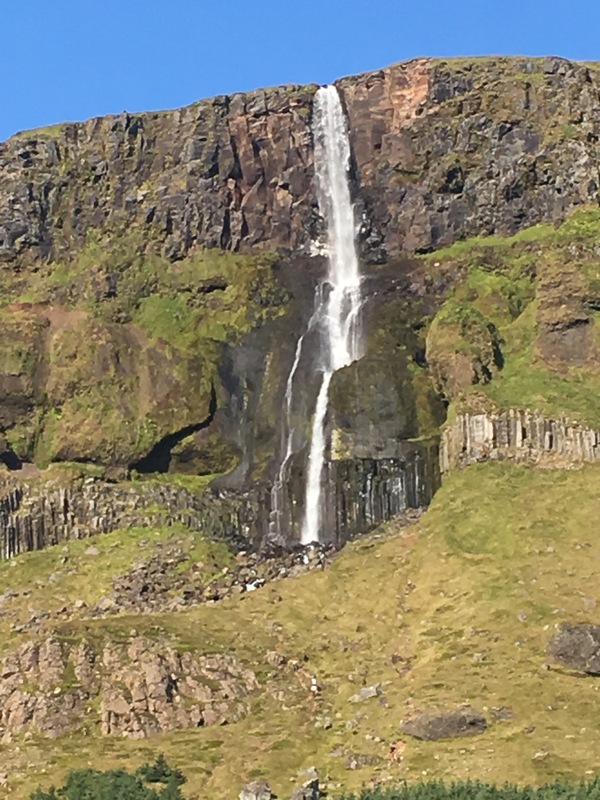 As I continued stopping for my photos I realized I had passed a large waterfall dangling from the cliffs. Unsure how, I vowed not to miss the next one. 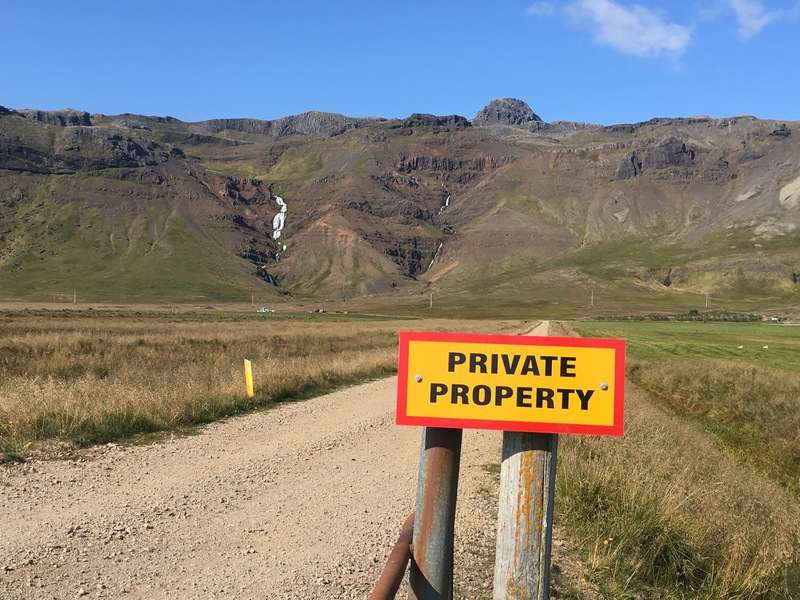 As it turns out, many of the waterfalls are not marked because they are on private property. I could still enjoy the views from the road; the heights made them unmissable, but I wanted to get closer. 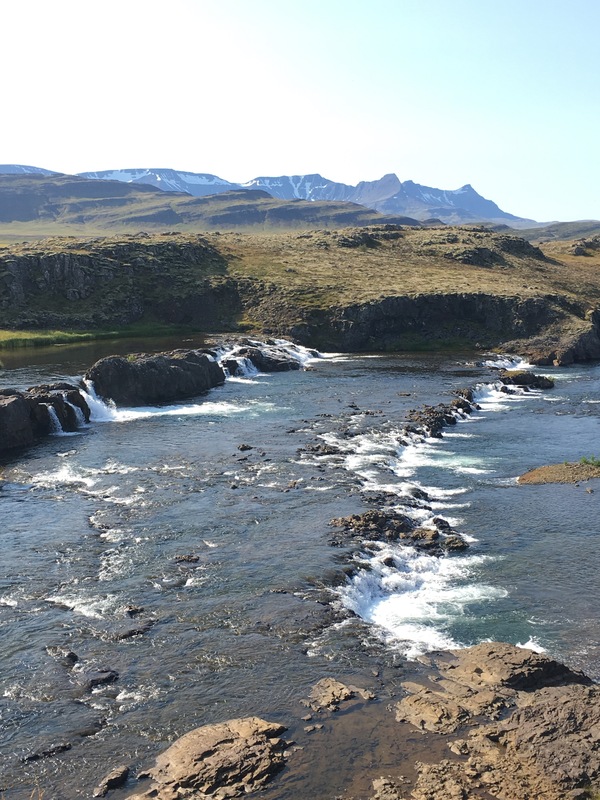 Thankfully, there were plenty along my route I could creep near, including Bjarnaefoss seen below, and each was cooler than the last. Reality caught up with me and I realized I’m running a few hours behind schedule. I increase my speed a bit more, until I see a parking lot with 20 or so cars stopped. 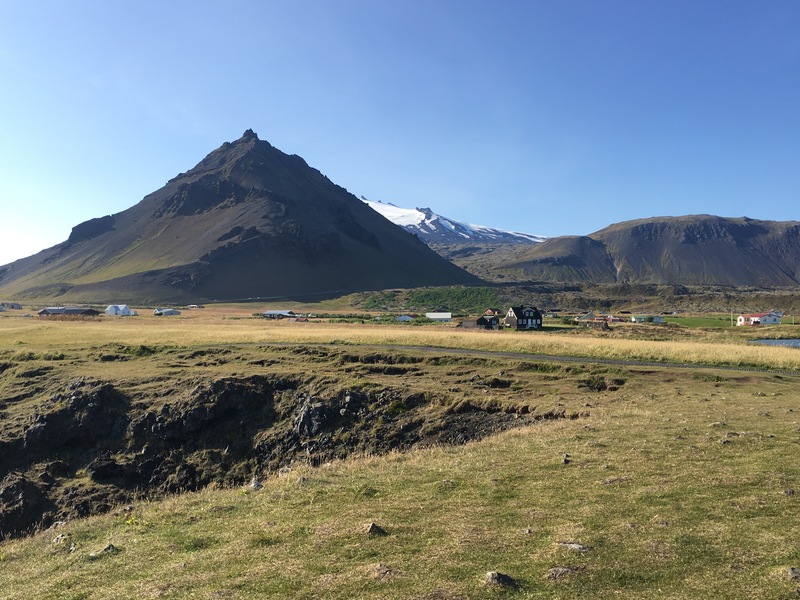 Iceland is rather remote. While I’m definitely not alone, it it possible to have a few minutes where you’re the only one around. Three cars is a crowd. 20 cars? Well, this must be quite the sight. So I pull over. 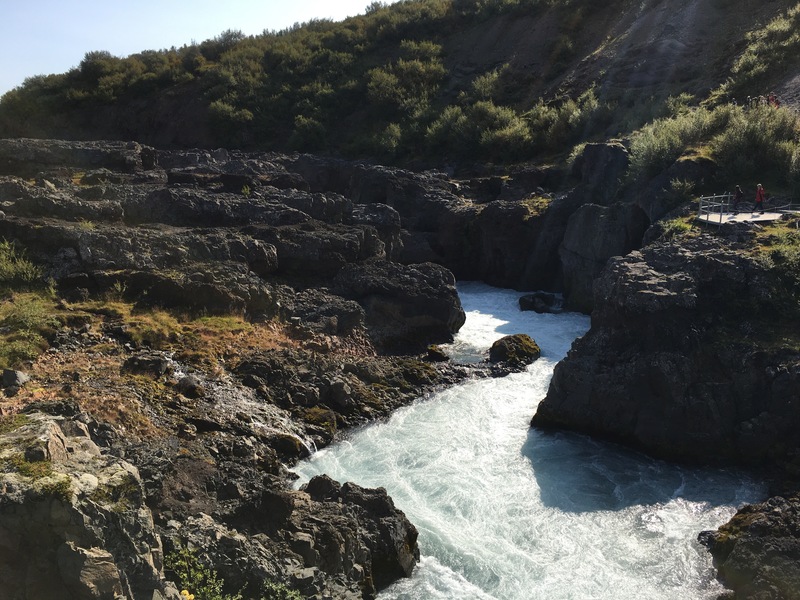 I had pulled up to the Raudfeldsgja Gorge. Wasn’t sure exactly what it was, but the general description on the sign was intriguing. I hiked my way up the cliff to a ravine. The hike was a long kinda steep walk; this better be good. And was it! 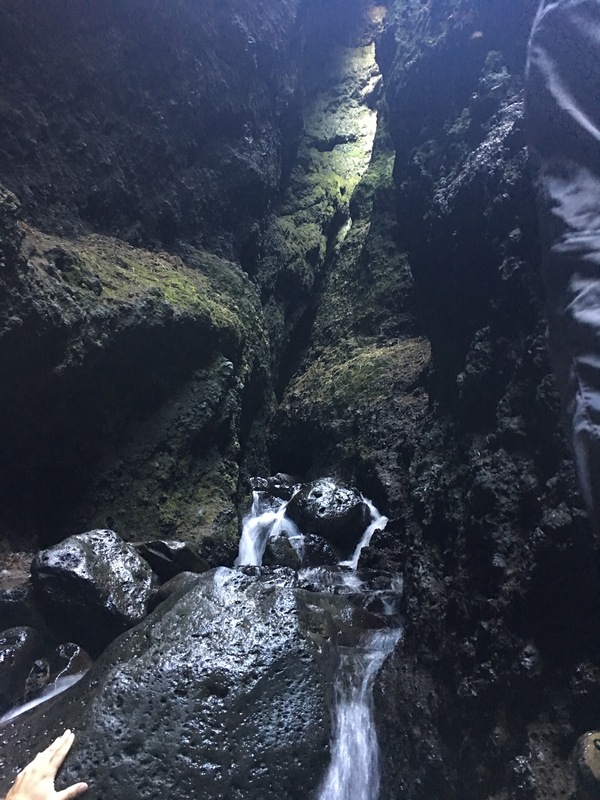 The gorge is a stream coming from the ravine that can be hiked into. My waterproof hiking shoes and I made our way as far in as I could. After a few twists and turns and passing many people who had given up, I was stopped by a couple trying to maneuver a steep increase that would require getting soaked in the falls to get up. If I had someone to pick my broken body off the wet rocks should I fall I may have continued, but for safety reasons decided to call it. I stopped for some awesome pics and video before crawling my way back out. I was euphoric after this stop. Felt like a kid. Smiling like an idiot and feeling refreshed. The cliff was unlike any experience I had had before. More than worth the delay! Back on the road, I still had Anstarpi and Hellnar to hit before the park. Both Anarstarpi and Hellnar are along the coast. 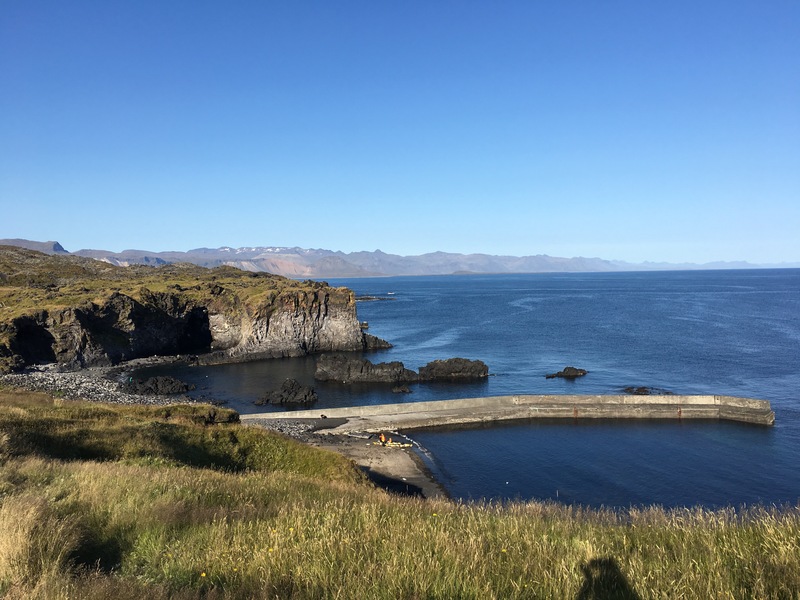 They are small villages of only a few buildings, about a mile apart, but they have captivating views of the ocean and picturesque basalt formations. Anastarpi blew me away. You can see Mt. 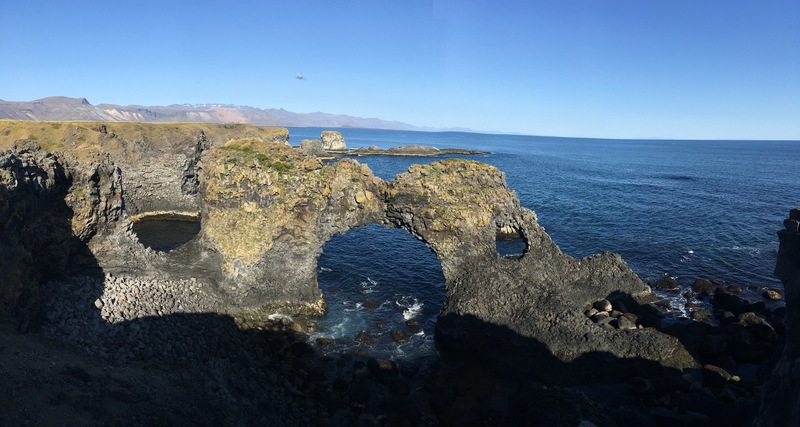 Stapafell, a volcano friend, in the background of the inland image, and Gatklettur-Arch Rock in the seaward pic. 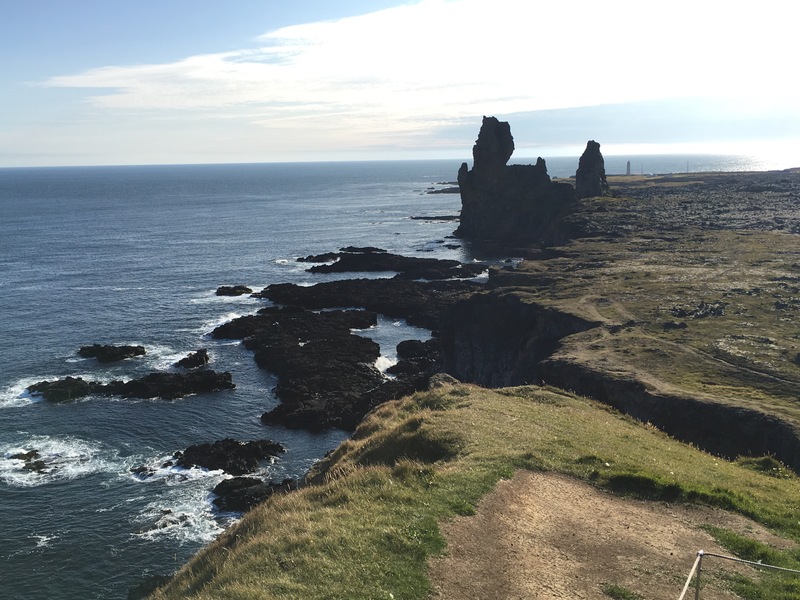 Hellnar’s shore was not quite as impressive as Anarstarpi. 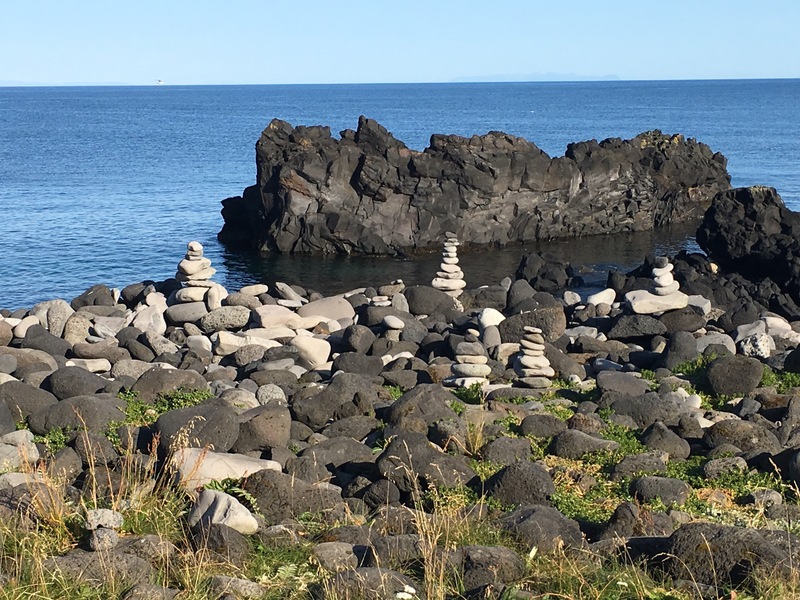 I recommend seeing them in reverse for the full effect, but Hellnar was full of cairns and is the oldest fishing village on the peninsula. 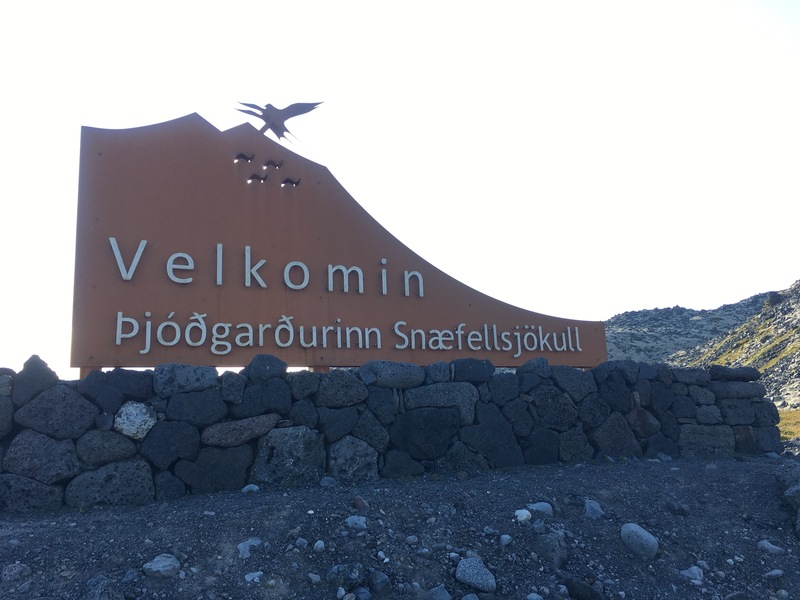 Had I stopped at the museum in Borgarnes, I would have known more about these two towns and their place in Icelandic sagas. 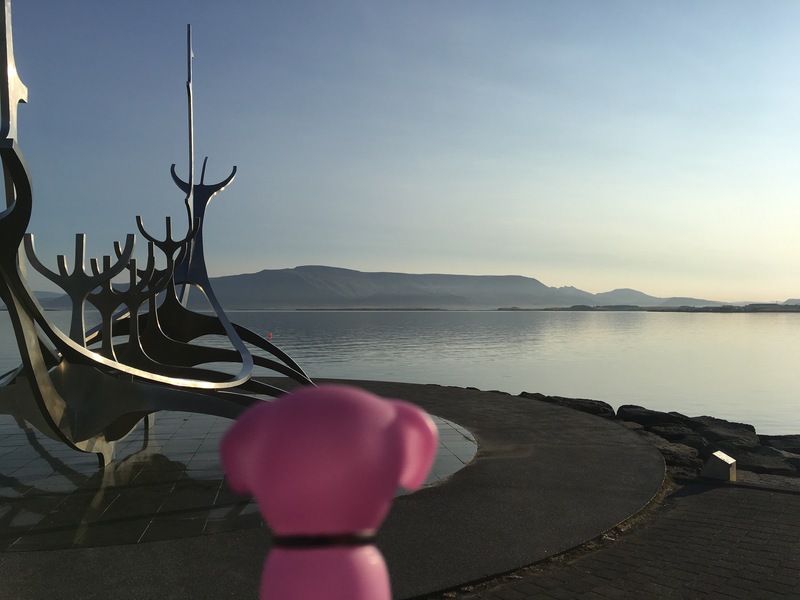 Now I was getting hungry and the sun was setting, but I hadn’t made it to the Snæfellsnes National Park yet! I feared it may have to wait till the next morning. 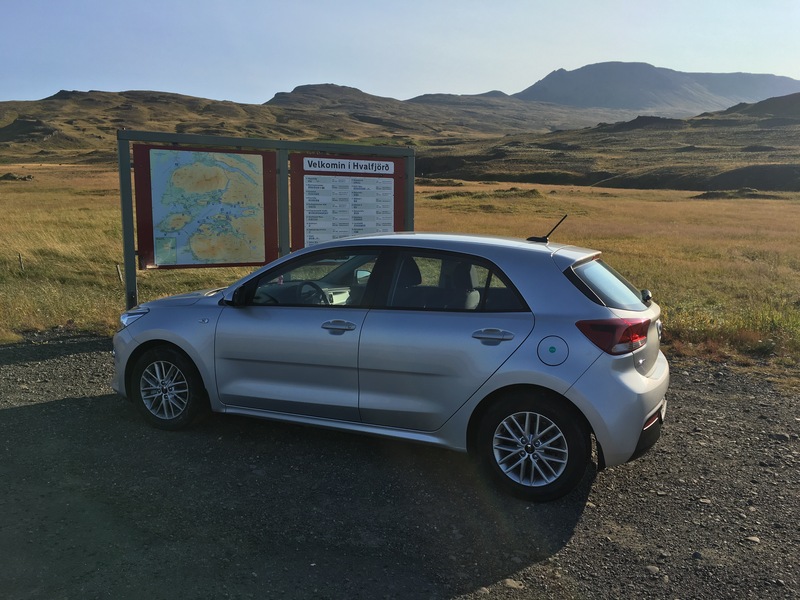 Turns out, you have to drive through the national park to get to the north side of the peninsula where my hostel was just outside the park’s northeast boundary! Sweet. 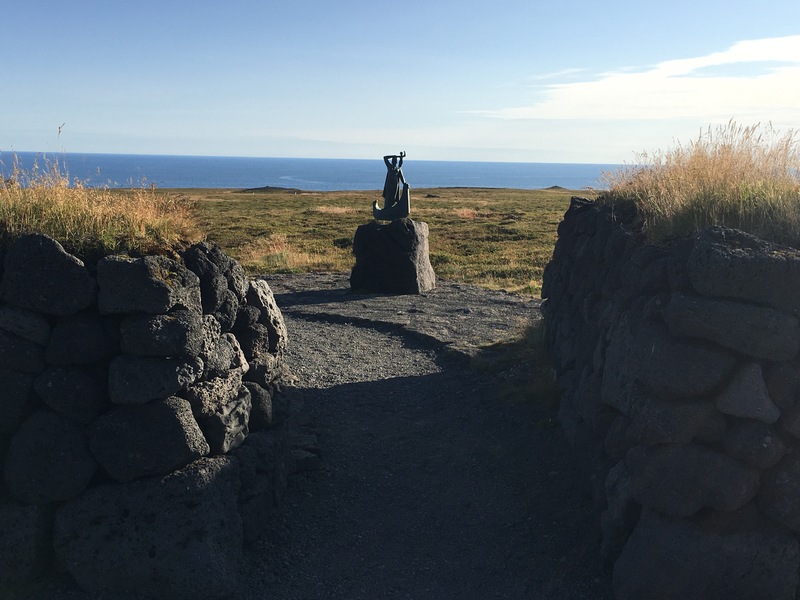 The park’s features include Snæfellsjökull, a glacier capped stratavolcano, its series of smaller volcano friends, and their lava field. They are surrounded by the ocean on three sides and because the Peninsula jutted west, it meant the sun was setting behind it all. 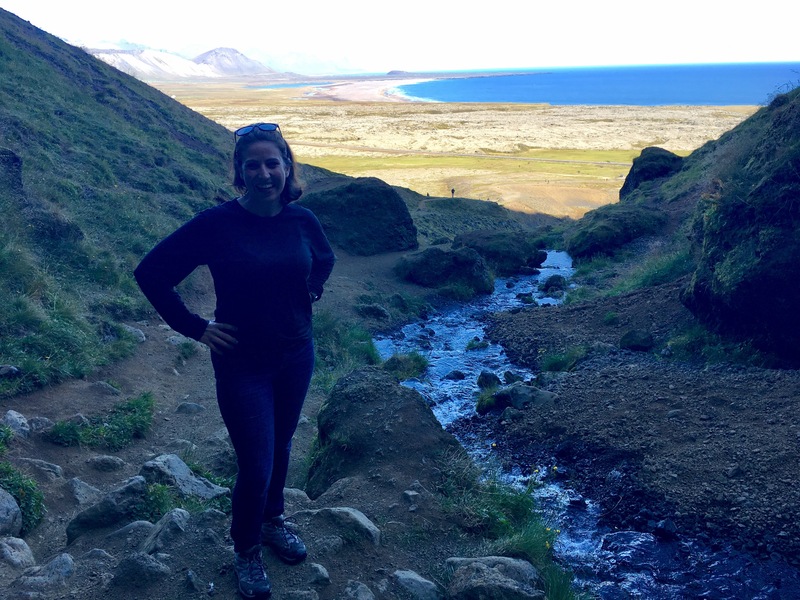 It is really hard to capture the magic of being on a peninsula where you can see lava surrounded by the ocean across 180 degrees from where you’re standing. 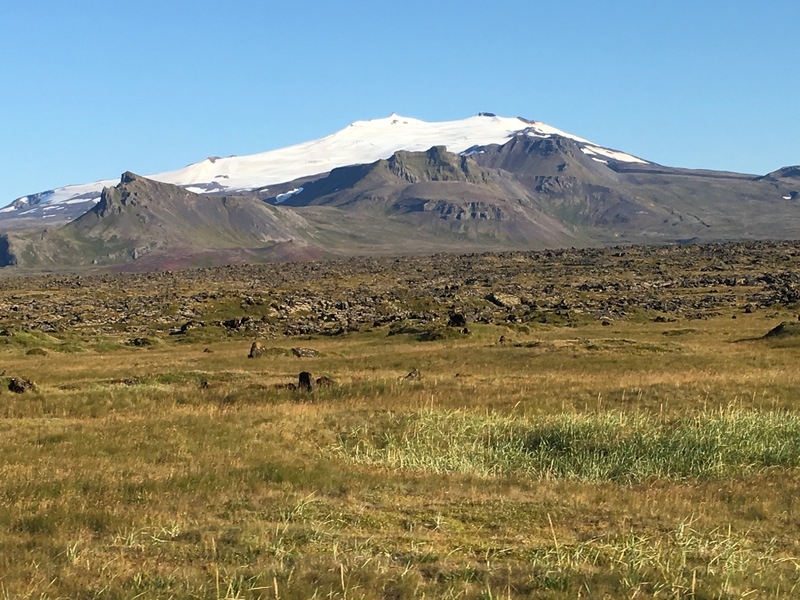 You get the sense that you’re standing on a small island, but when you turn around to finish the 360, your eyes gaze upon a large volcano with a white glacier cap. I made some quick stops at historical markers and monuments, passed a lighthouse, and made my way to the north side. This is a pic of Laugarbrekka where Gwas born. She is believed to be the most widely travelled woman of the Middle Ages. Born in 989, she had traveled to the US part of North America, and been to Europe eight times. She is also said to have given birth to the first caicasian born in North America, Snorri. I finished my way around the peninsula to Rif. 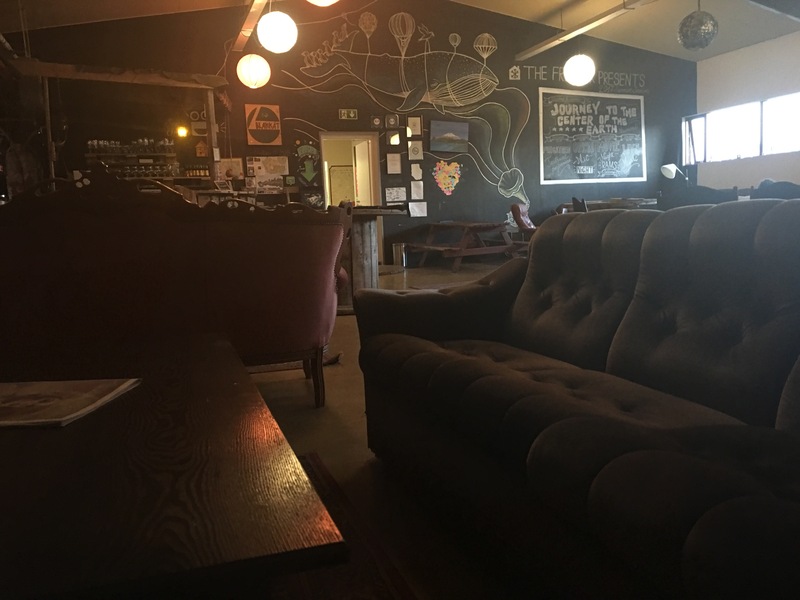 I checked into my bohemian styled hostel, The Freezer, and made my way to a recommended restaurant in the next town over for dinner. 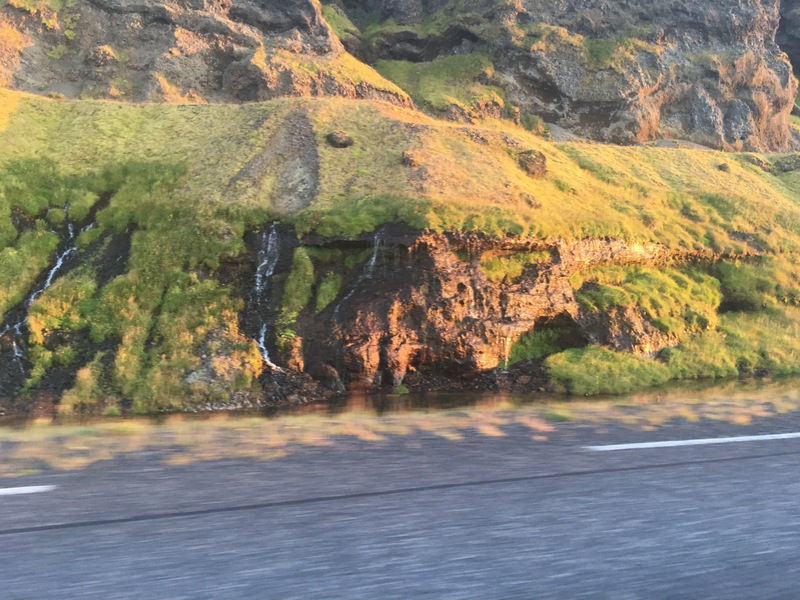 What I didn’t realize was that along the road was a series of waterfalls where the cliffs dropped for the road. Too many to count and definitely too many to photograph, but it was a pleasant surprise. I pull up to the restaurant, Hraun, and bust out laughing. There’s even a waterfall behind the restaurant! After eating and recapping my day, I checked the northern lights levels and it was the same level as when I saw them dance in 2016. I stepped outside to see if they were nearby. They weren’t and I was too tired for any more adventures. I put myself to bed. I fell asleep almost instantly. The day was long, but mesmerizing and memorable. Plenty to fuel my nighttime dreams. Note: Apologies for any rough images. Had to use the ones on my iPhone. I’ll update with better images from the camera when I return.